Hello, and thanks for allowing me to speak about my 2018 EAS experience. As a first time EAS attendee, I wasn’t sure what to expect from 5 days of beekeeping information surrounded by 100s of beekeepers all from different backgrounds. In a word – Fabulous! I focused my EAS adventure on mite control, mite disease issues, hive management for minimizing bee losses and queen management. For example, I was thrilled to stand beside Mike Palmer who demonstrated how to find that impossible to find queen and to then get him a bit off subject on what he thought of the hives’ brood pattern. He felt it had mite issues which were proven with an unplanned, off schedule mite count. This was how it went, excellent information, backed up with scientific data and open to free flowing questions from the groups. Often, after programs finished, small impromptu groups discussed beekeeping. Many of us are familiar with mite count testing and the various mite treatment options that are available. Seeing research data that confirms some of what I know and/or conflicts with things that I thought I knew is a plus to my beekeeping development. As an example, some research is suggesting that virus infected queens can transmit the virus to the egg. If that is true, mite control alone will not fully protect the larva from bee viruses. This slide is from one of my failed hives confirming the importance of knowing mite counts before winter. This hive was treated in 2017 and failed in late February 2018. 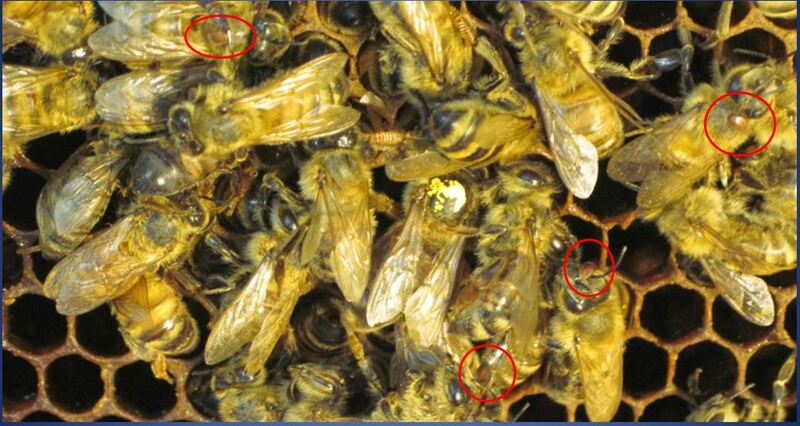 Looking closely, one can see dead mites on dead bees with a marked dead queen. My mite control plan failed. After EAS I have a better understanding of what I can change to improve my technique. I’m sure what I learned at EAS in 2018 will help my bees in 2019. Thank you to everyone that made EAS possible. As a part of my training yard effort, I often field questions for the beekeepers that my activity reporting message reaches. Currently, the training yard is preparing to produce a few nucs that with some luck, will overwinter.